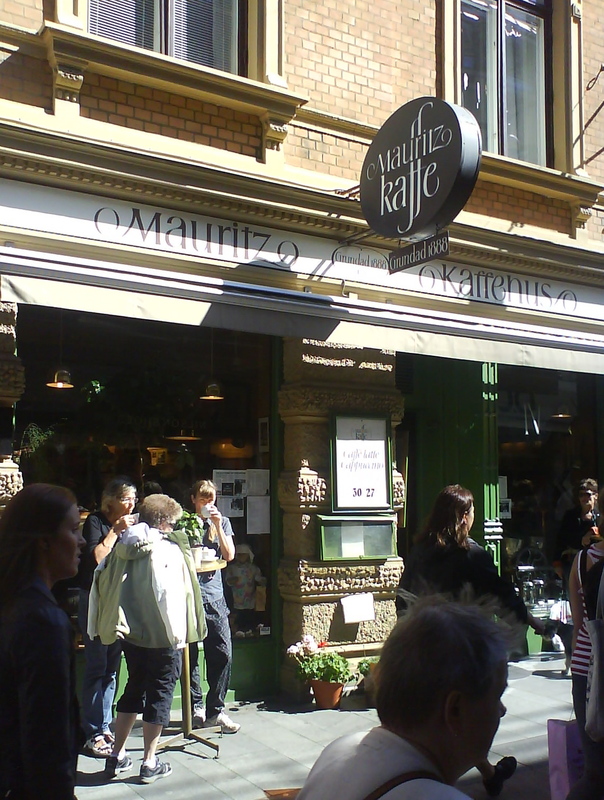 Mauritz Kaffe is an institution in the Gothenburg coffee circles. It is famous not only for its coffee and great buns and sandwiches, but also for being the first really italian inspired coffee bar opening in Gothenburg. Not to say in Sweden. It is a funny, eccentric place and I have therefore grown to love it. 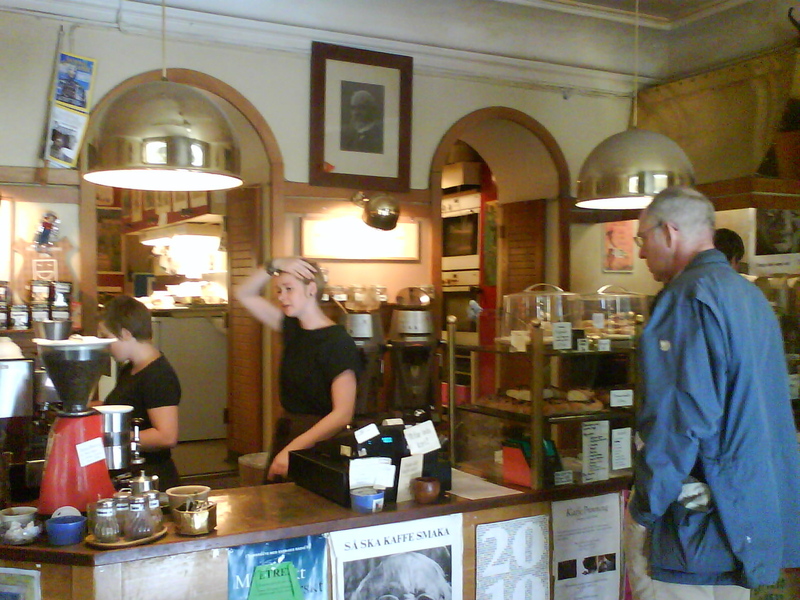 You find this coffee bar, or coffee house as the owner Tord Wetter preferes to call it, on the busy Fredsgatan, no. 2, in the middle of the city center. Wherever you are planning to go in central Gothenburg, you will inevitably pass by Brunnsparken, one of the three major squares where all the busses and trams pass, and Fredsgatan is one of the main arteries leading further into the heart of the city. Mauritz Kaffe is therefore close to everything. You can’t miss it. When I went a few weeks ago it was my first time in years, but it was like having it been stuck in a time warp where everything was just like in 1993, or 2004 for that matter. That is a quality I like and find fascinating with institutions like this, and since Mr. Wetter opened this place in 1971 and it has been a hit ever since, he should know. Being the fourth generation of coffee connoisseurs running Mauritz Kaffe, the name comes from his great-great-great grandfather Mauritz Svenson whom started the business in 1888, Tord is now fighting a battle against the big and mighty city council and his landlord who have agreed an unreasonable, and in the case of Mauritz Kaffe devastating, increase in rent. Running a business like this you can never compete with high street names the likes of H&M, Starbucks or Zara, but that does not mean that the inner city have to contain nothing else but. A city planner, responsible city architect or what have you must cherish and appreciate the variety and diversity businesses like this bring to the overall picture and experience of a modern inner city. So I dearly hope that Mauritz Kaffe will be at its current address for many years to come. The coffee though; any good you might wonder? It’s great. Otherwise this place wouldn’t still be up and running after all these years. My Ethiopian coffee (yes, you can choose from a number of various blends and pure beans), served in a Presso coffee maker, was just as fruity and well rounded as I wanted it. The espresso a few days later was also great. I haven’t tried their milk drinks yet, but there is no reason what so ever they would not be top notch too. An update will come in a month or two when I have been back. If you go here, you should not miss the sour-dough plum buns. I know, how nice does that sound? you might think. But they are heavenly.